An important painting: Nanadaime Danjuro sugata-e, “Portrait of Danjuro VII.” Painted at the end of the Bunka period ( c. 1815 ), it shows the young Danjuro after his succession. 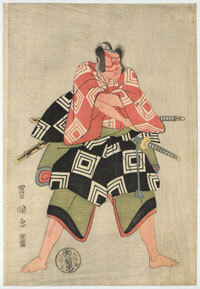 He wears the Danjuro mimasugoshi, Danjuro’s triple-plaid kimono pattern. 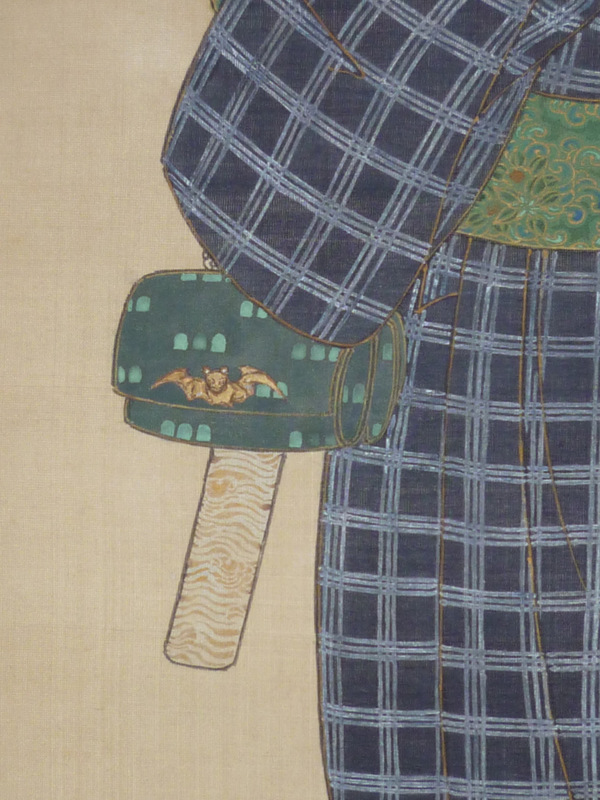 His favourite tobacco pouch with the bat-shaped catch is hanging at his waist. 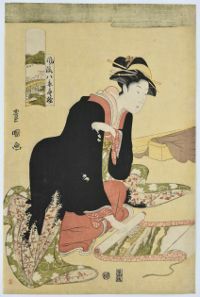 He is looking at two butterflies. An allusion to the famous story of Zhuang Zhou who dreams of being a butterfly, only to wake and wonder if he is, in fact, not a butterfly dreaming of being Zhuang Zhou. The story symbolizing the evanescence of life. 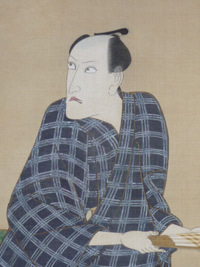 A similar painting of Nakamura Utaemon II dated 1812 is in the Museum of Fine Arts, Boston, acc. No. 11.7864. Full colour on silk. Image size 23.25 x 11 inches; 59 x 28 cms. Two repaired wormholes not affecting image, otherwise very good condition. Interesting old embroidered and hand-painted mount. 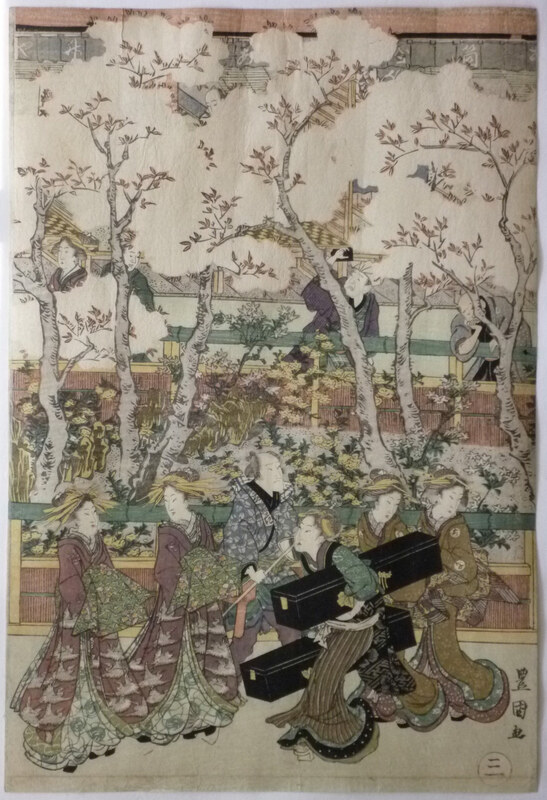 Signed Utagawa Toyokuni ga with seals Ichiyosai and Toyokuni. 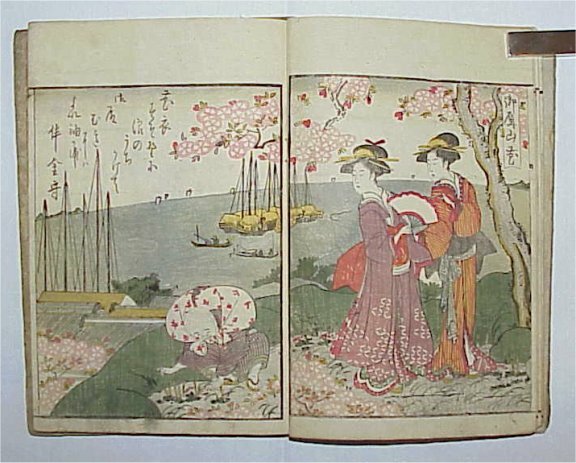 An extremely rare complete pentatych ( each sheet numbered at the bottom ): Shin Yoshiwara sakura no keshiki, “Cherry Blossom in the Yoshiwara.” A panorama of the main Nakanocho street in early April with transplanted cherry trees. 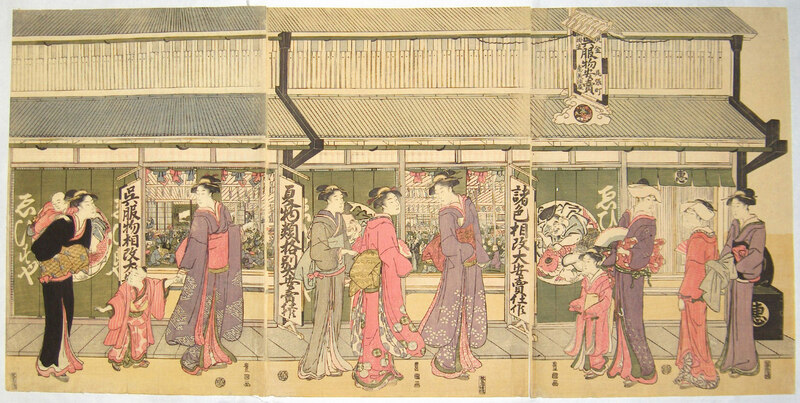 The main entrance to the right on the first sheet, the other sheets showing a multitude of courtesans, kamuro, shinzo manservants and customers. A fascinating design with a multiplicity of small vignettes. 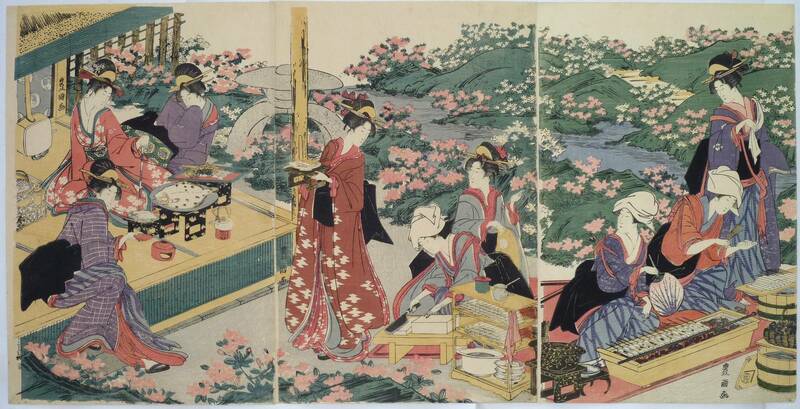 Cherry blossom was used as a euphemism for the quickly fading beauty of the courtesan. 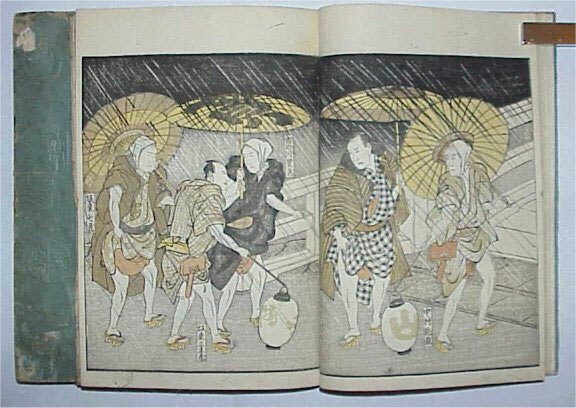 Published c 1810 by Yamatoya Kyubei. Very good impression; very good colour. 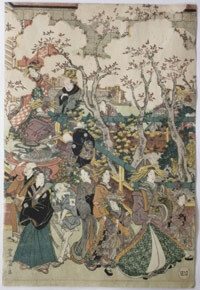 Slight horizontal line near bottom edge and slight thinning otherwise very good condition. Signed Toyokuni ga on each sheet. Ehon kukuri-zome, “Tie-Dyed Work”. Two volumes complete. Original covers and one title slip. 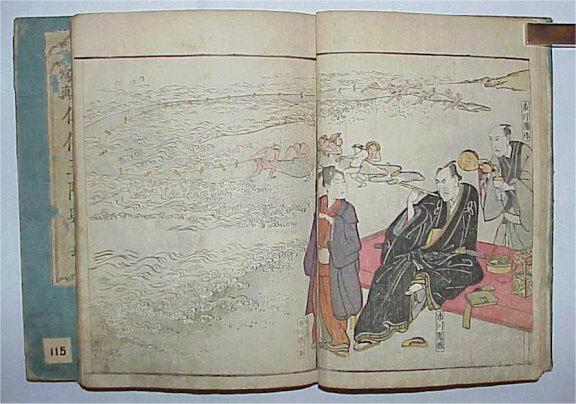 Published by Izumiya Ichibei, 1794. Shows bijin at famous spots around Edo. Some backed wormage on vol. 2 and some damage to covers, but otherwise good condition with exceptional, pristine colour. Extremely rare. Ex Haviland and Duret collections. 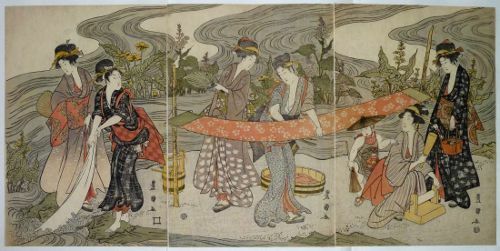 A beauty from a set Furyu hakkei, “Fashionable Eight Views.” Each beauty represents one of the famous Eight Views of Omi, here being Evening Glow at Seta.This theme, which originates from China, is often encountered in Japanese art. 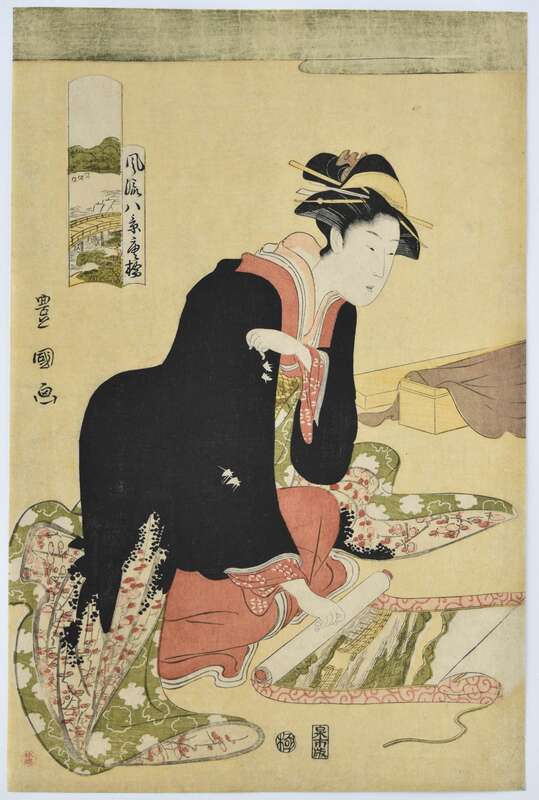 Shows a young woman unrolling a scroll with a view (presumably) of Seta Bridge. An extremely rare set with the designs standing alone but also forming diptychs. 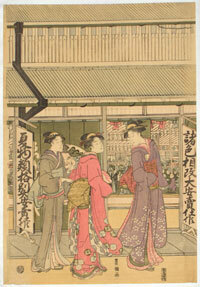 Three other single prints from the set are illustrated in Ukiyoe-e Taikei, vol. 9, no. 6, Night Rain, in colour, and nos. 101, Evening Snow and 102, Returning Sail, in b/w. 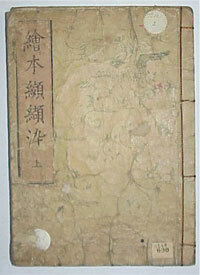 A complete (faded) diptych is in the MFA Boston, Returning Sail and Returning Geese, 21.7473-4. I cannot, at the moment, locate another impression of this design. 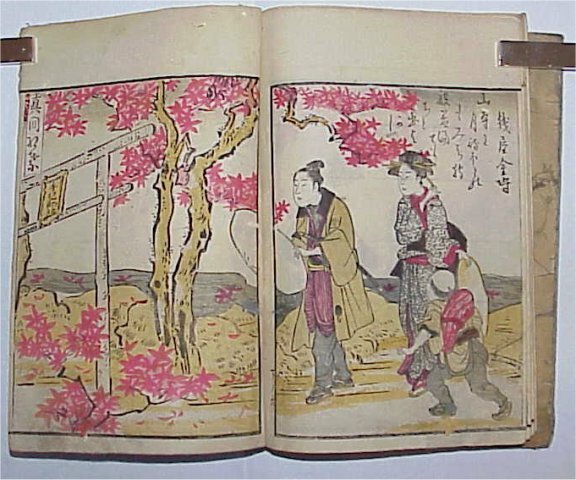 Published by Izumiya Ichibei (Kansendo) c 1794 – Toyokuni’s best period. Provenance: Ex collection Hayashi (seal bottom left) and Louis Gonse. A beautiful print. Fine impression. Slight loss of gold in cloud at top but otherwise fine colour. Fine condition. 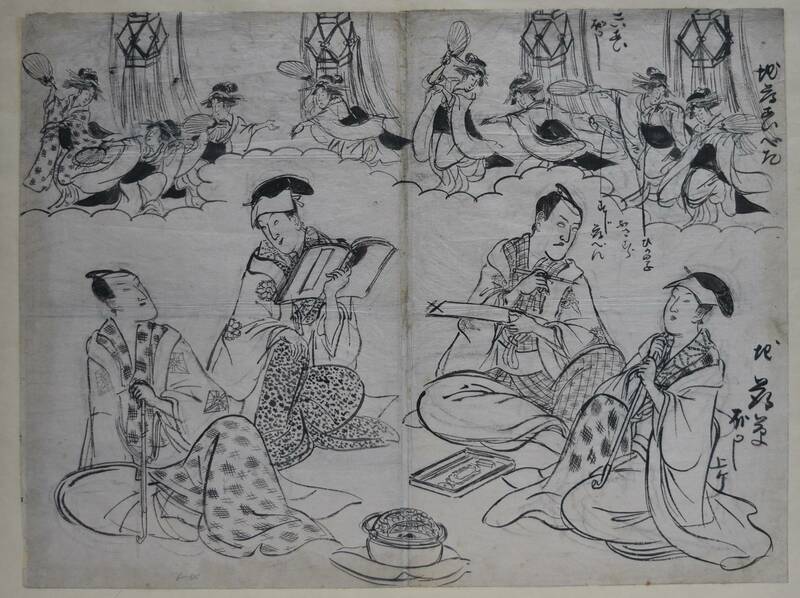 Signed Toyokuni ga.
Two volumes complete Yakusha sangaikyo, “Amusements of Actors on the Third Floor” (iez the dressing-rooms or green rooms). 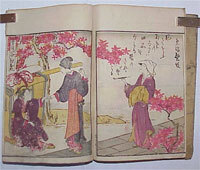 Published Kansei 13 (1801) by Nishimiya Shinroku and Yorozuya Tajiemon, Edo. An extremely rare and important work showing actors engaged in various private pursuits and not on stage, as is normal. 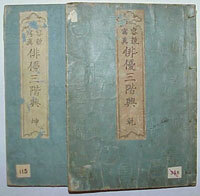 Original covers and title slips. Ex Duret and Gillot collections. Slight turning of some colours on vol two and some slight thumbing on bottom corners of some sheets, but overall very good and an essential item for any serious collection. A very fine portrait of the actor Ichikawa Danjuro VI in kumadori make-up and assuming an aragoto stance. The quality, date, style and publisher are the same as for his finest set of Portraits of Actors on Stage published 1794 – 6 although this design appears not to be from the set and I cannot locate another impression. 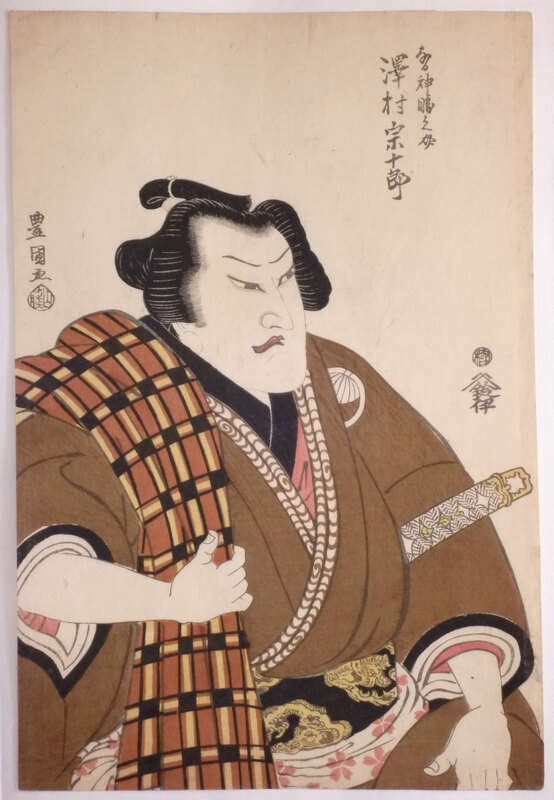 There is a bust of Danjuro, probably in the same role, by Toyokuni in the same year – 1796 in the Achenbach, San Francisco. Published by Senichi. Extremely fine impression and colour. Grey ground. 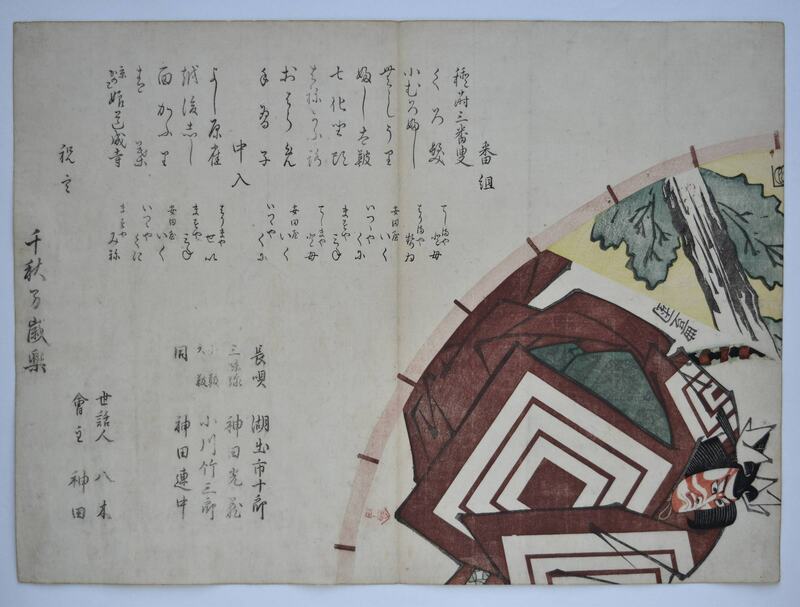 A seal at bottom which appears on many Toyokuni I and Toyoshige prints and is probably a book and/or print seller ( it gives an address ). Very small binding holes at left edge. Full size. Fine condition. 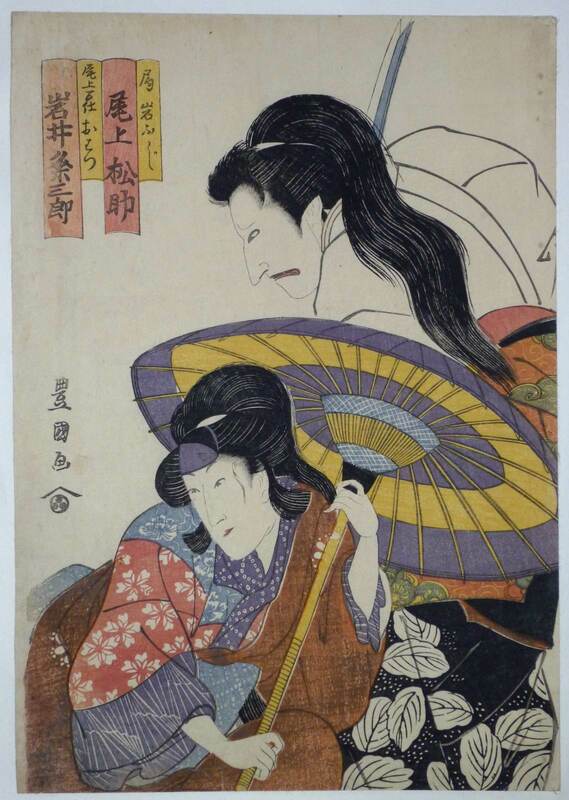 Signed Toyokuni ga.
Shows Iwai Hanshiro IV as the wet nurse Masaoka and Sawamura Tozo as the evil serving lady Yashio in the play Omiura date nebiki performed at the Nakamura-za, 2/1799. 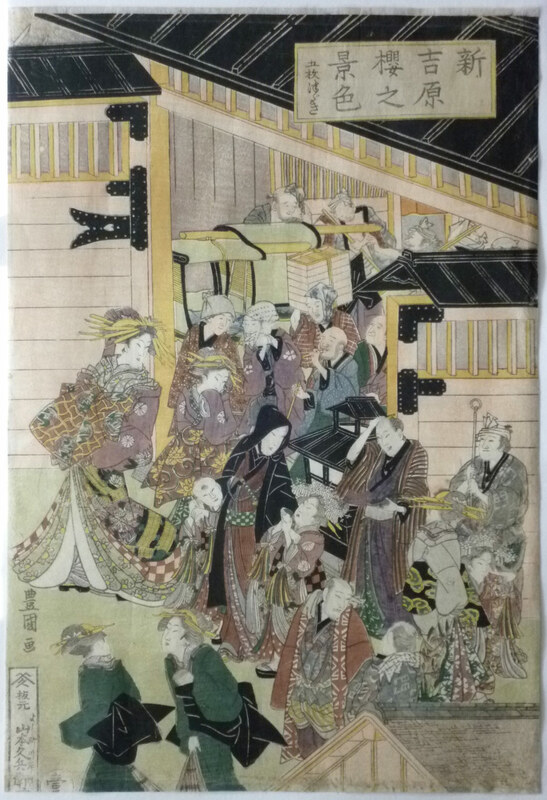 Published by Eijudo. Light grey ground. Fine impression, and condition. Perfect colour and completely untrimmed. 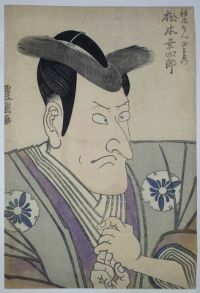 Signed Toyokuni ga.
A silver mica-ground double bust portrait of Hikosaburo Bando III as Kan Shojo ( Sugawara Michizane ) disgraced and sent to Tsukushi, and Kataoka Nizaemon VII as Hakudayu from the play Sugawara denju tenarai kagami, “Sugawara’s Secrets of Calligraphy.” The play was written for the puppet theatre in 1746 and quickly adapted for Kabuki. 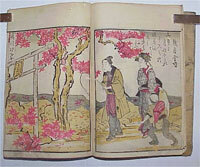 Published by Yamaden, Kansei 8 ( 1796 ). Extremely rare. Unidentified collector’s seal au verso. Fine impression. Perfect colour. Some slight loss of mica ( as per usual ) and a slight centre fold. 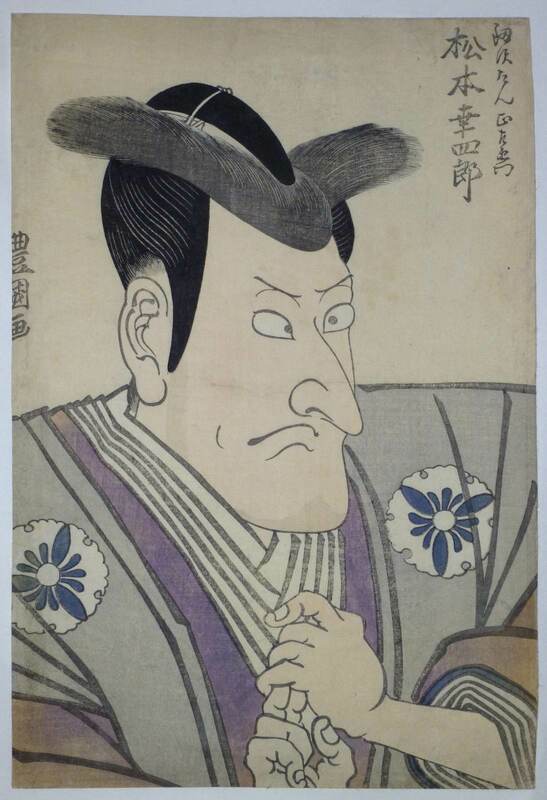 Signed Toyokuni ga.
An aiban bust portrait showing Iwai Hanshiro IV in an onnagata role. 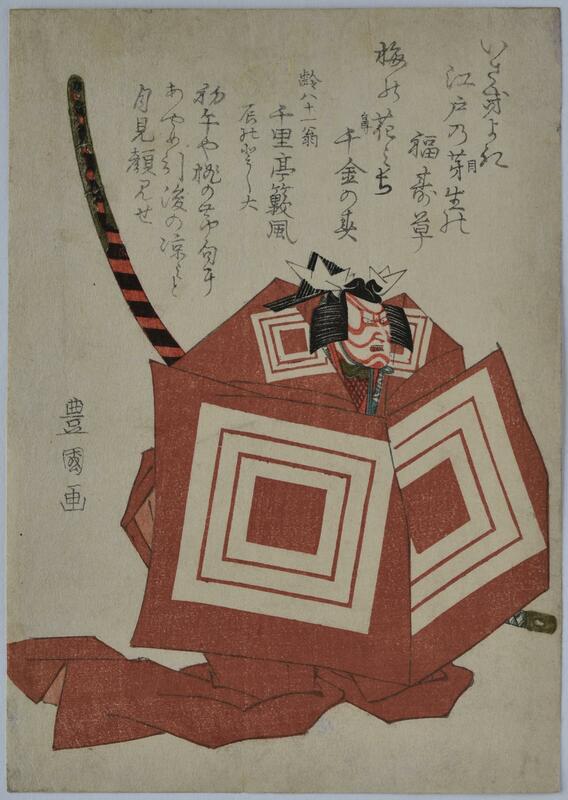 Published by Yamaguchi Chusuke c 1794. Another aiban okubi-e of the same actor in another onnagata role and of the same date was published by Tsuruya Kiemon. A rare and fine design. Fine impression. Very good colour. Slight trimming, otherwise very good condition. 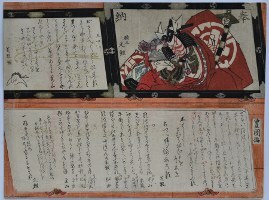 Signed Toyokuni ga.
A complete diptych showing Kagekiyo and Mihonoya no Shiro battling. 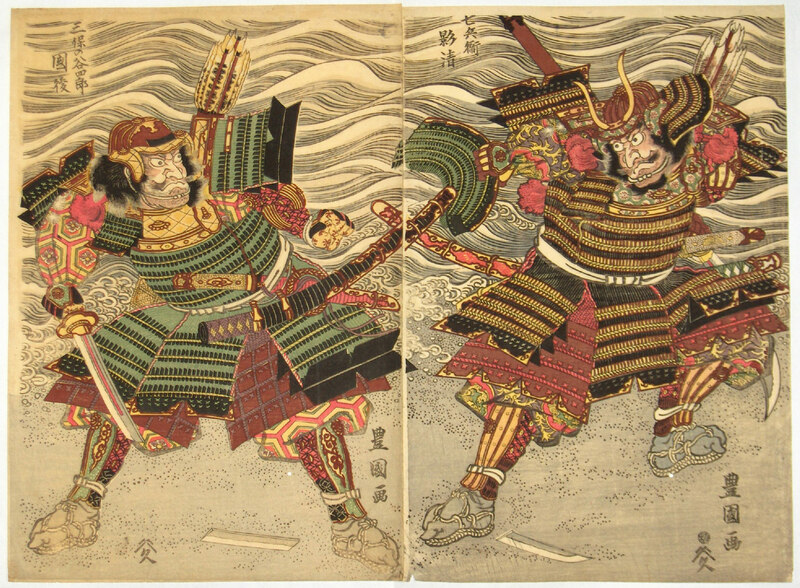 This is an episode from the beginning of Chapter 5, “The Dropped Bow” in book 11 of the Heike Monogatari, “ Tales of the Heike.” This episode, which took place in 1184, has the Genji warrior Mihonoya no Shiro confronting the Heike Kagekiyo on the beach at Yashima. Published c 1815 by Yamamotoya Heikichi. Fine impression and in exceptional condition. 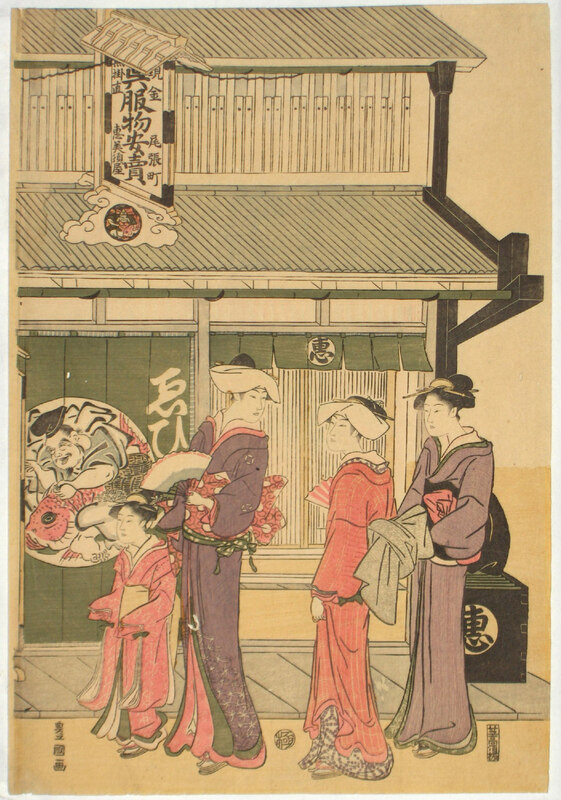 Fine colour with large borders left and top. Signed Toyokuni ga.
A wonderful design showing the actor Ichikawa Ebizo VI ( Danjuro VIII ) holding a large umbrella with his face reflected in a mirror held by an acolyte. 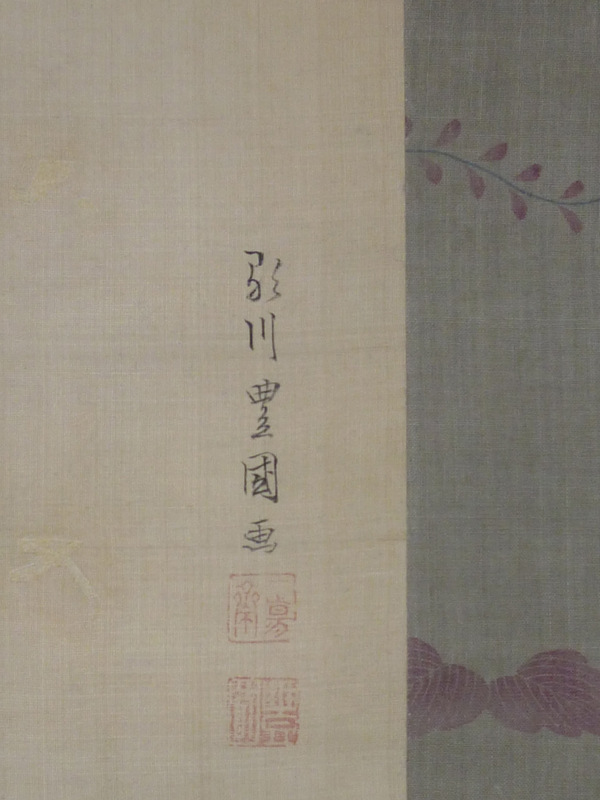 Two poems above by Sakuragawa Jihinari and Jihinari’s son Oya no Omokage. 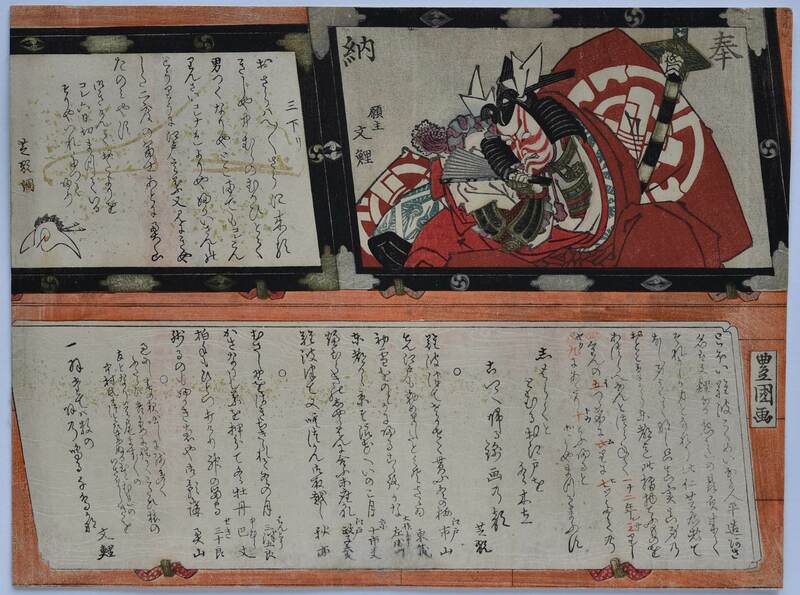 In fact these two writers also composed poems for two other Toyokuni surimono of Danjuro around the same date, c. early 1820s. ( See The Art of Surimono, Roger Keyes, 1985, no. 348, p. 400 and One Hundred Surimono in the collection of Sidney C. Ward, 1976, no. 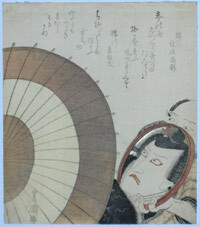 50, p. 62. ) Extremely rare. Fine impression. Minor creasing and turning of purple, otherwise very good colour and condition. 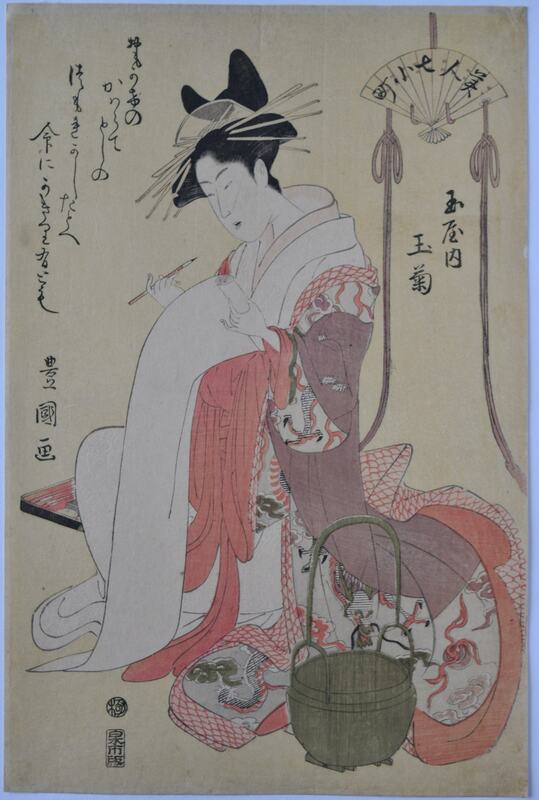 Signed Toyokuni ga.
An elegant triptych showing tofu being prepared and other ladies on an engawa with various fish dishes. The restaurant or inn is beside a stream which is heavily planted with flowers. 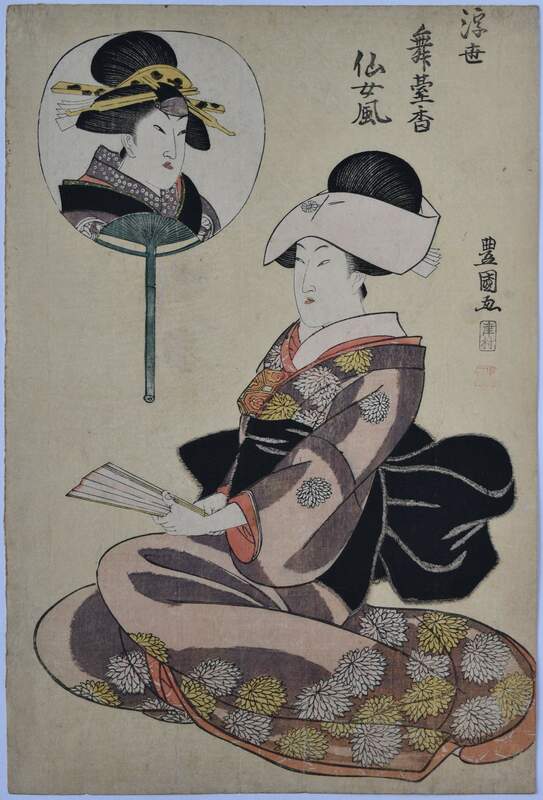 Published c 1809 by Tsuruya Kinsuke. Very good impression. Perfectly retained colour. Full size. Perfect condition. 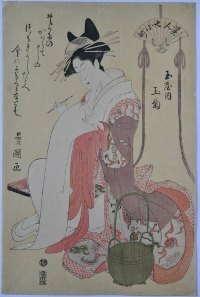 Signed Toyokuni ga. 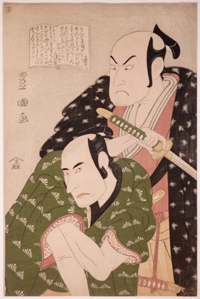 The actors Otani Tomoemon II as Iwaki Yagenji and Bando Mitsugoro II as Wakato Tomoji in the play Tsuki wa Musashino aki no sewa goto performed at the Kiriza theatre, 7/1797. One of Toyokuni’s best double bust portraits. 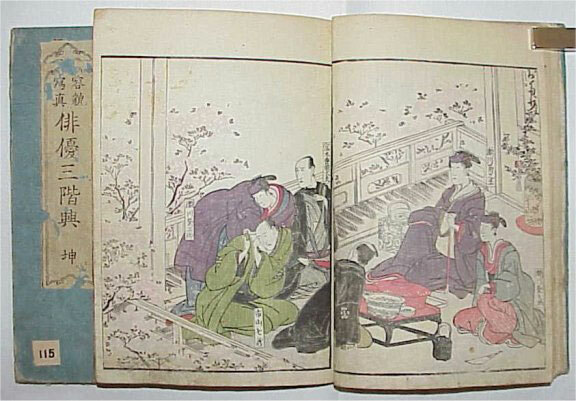 Published by Moriya Jihei 1797. Ex Hayashi collection ( seal top left ). Fine impression. Very good colour. Very slight centre fold and one small wormhole. 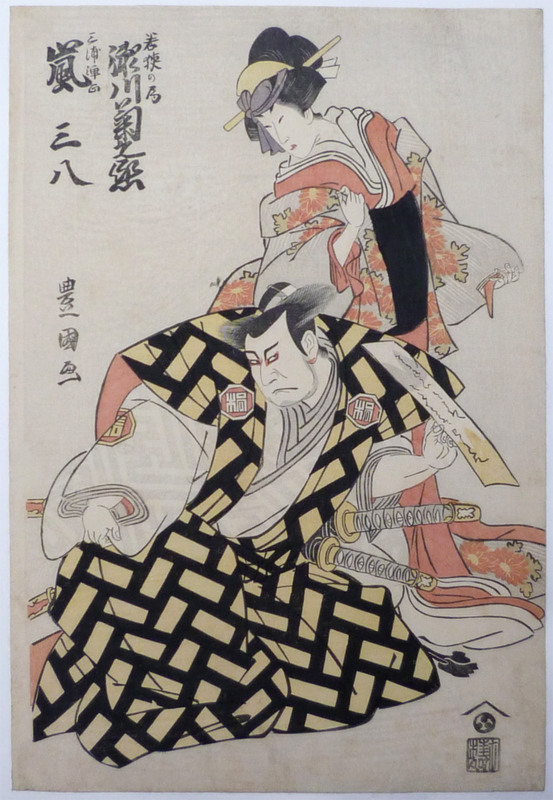 Signed Toyokuni ga.
A double actor portrait showing Ichikawa Yaozo III in the role of Ume no Yoshibei, and Segawa Kikunojo III as his wife Koume, in the play Zoho Ume no Yoshibei performed at the Ichimura-za Theatre in the 4th month of 1801 ( Kyoho 1 ). Published by Uemura Yohei. 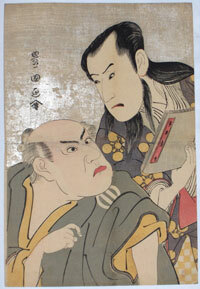 Toyokuni was the pupil of Utagawa Toyoharu and went on to produce some of the finest actor prints of the period. Fine impression, colour and condition. Full size. 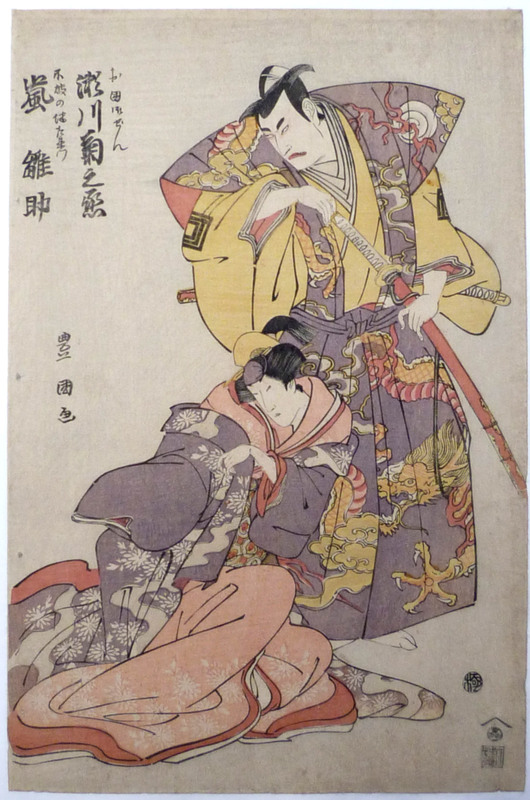 Signed Toyokuni ga.
A double actor portrait showing Arashi Hinasuke II in the role of Fuwa Banzaemon, and Segawa Kikunojo III as the lady Okuni Gozen, in the play Jujo Genji Monogusa Taro performed at the Ichimura-za Theatre in the 8th month of 1800 ( Kansei 12 ). 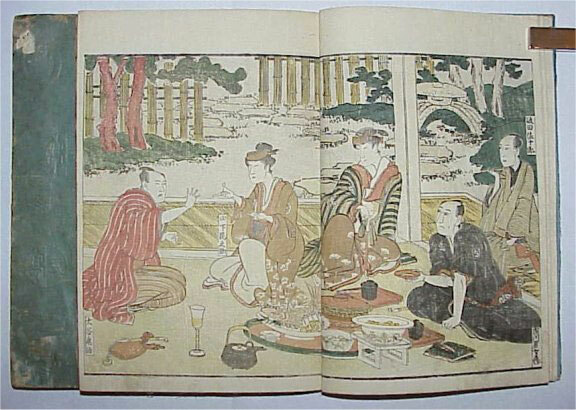 Published by Nishimuraya Yohachi. 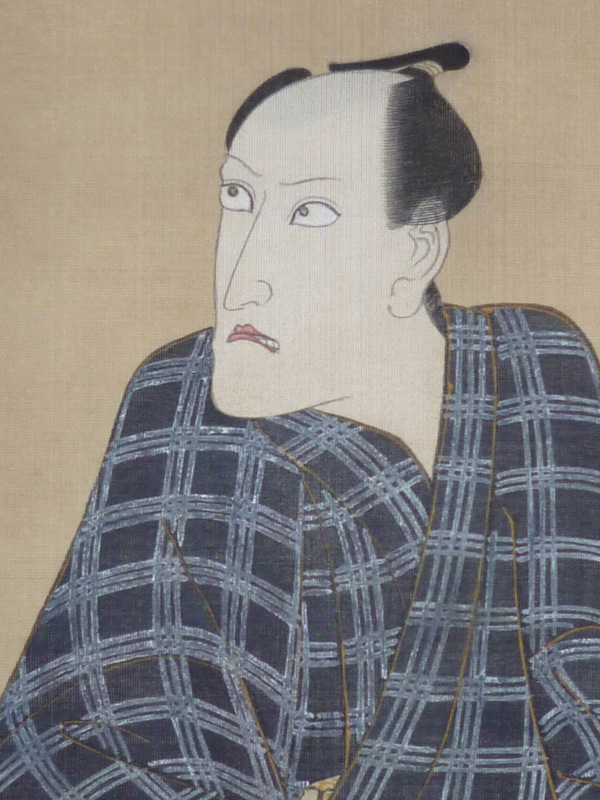 Toyokuni was the pupil of Utagawa Toyoharu and went on to produce some of the finest actor prints of the period. A fine double actor portrait showing Segawa Kikunojo III as Wakasa no tsubone, and Arashi Sanpachi I as Miura Danjo in the play Utsukushiya yuki no sekai, performed at the Ichimura-za Theatre in the 11th month of 1799 ( Kansei 11 ). 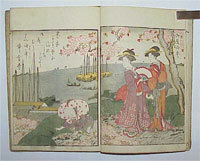 Published by Nishimuraya Yohachi. Toyokuni was the pupil of Utagawa Toyoharu and went on to produce some of the finest actor prints of the period. 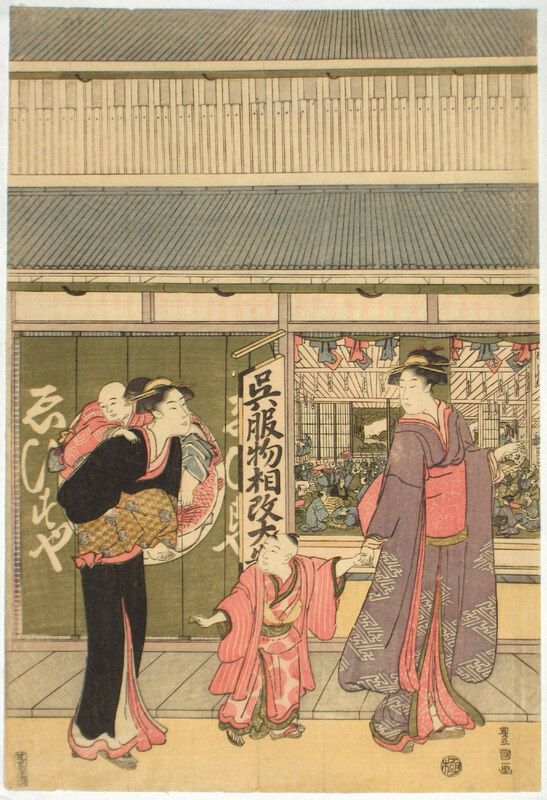 An extremely fine triptych showing beauties and families outside the famous dry goods store Ebisuya. 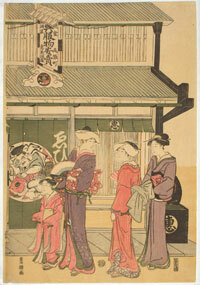 ( Two roundels with the shop’s symbol Ebisu – one of the Seven Gods of Good Luck – are on either side of the entrance. ) 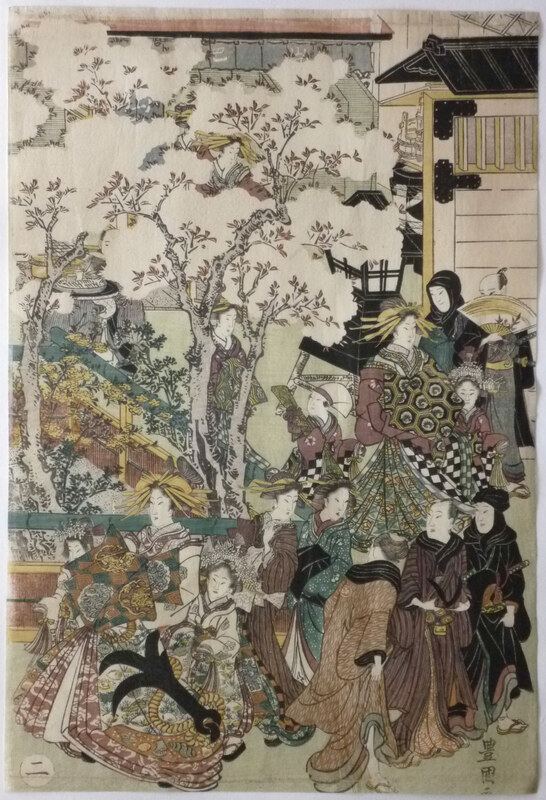 Besides the elegance of the figures, there is an added anthropological perspective as we can view the crowds of customers inside the building. Presumably Ebisuya was the prime motivator in getting this print published. 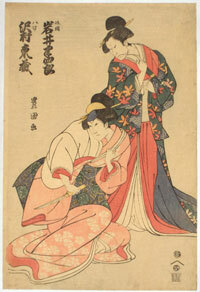 Another impression ( ex Spaulding collection ) is in the Museum of Fine Arts, Boston, accession number: 21.7744. 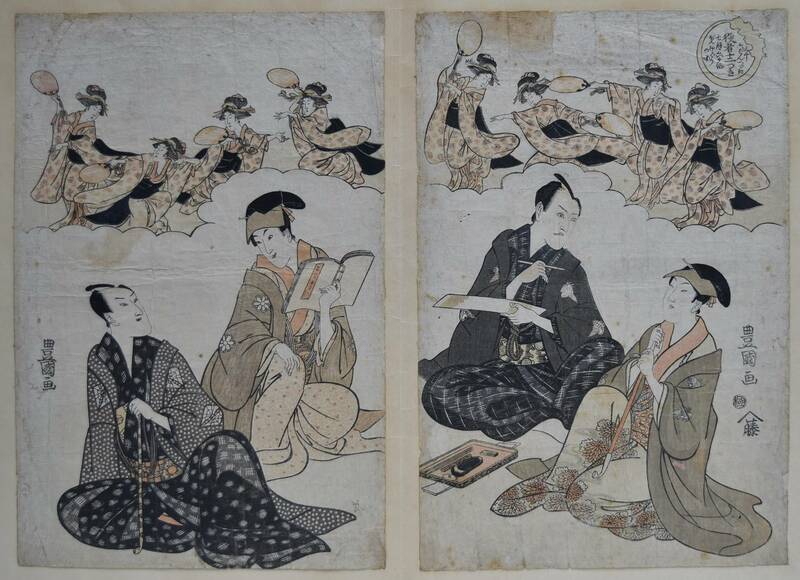 Published by Takasu Soshichi, c 1795. Very rare. Fine impression with exceptionally well preserved colour. One small area affected by damp, otherwise in remarkably fine condition. Full size. Signed Toyokuni ga. The centre sheet of a hosoban triptych possibly showing Danjuro VI as Ashikaga Takauji or Prince Takahiro. Ex collection Walter von Scheven, 1878 – 1950, and purchased by him at Altkunst, Berlin in 1929. A fine design. Fine impression and colour. 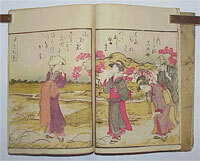 Very small repaired binding holes, otherwise fine condition. Unsigned. The actor Ichikawa Yaozo III as Umeomaru, the loyal retainer of Kan Shojo in the Kuruma biki, “Pulling the Carriage Apart,” scene from the play Sugawara denju tenarai kagami, “ Sugawara’s Secrets of Calligraphy” performed at the Miyako Theatre 7/1796. 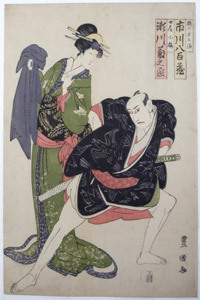 This is one of the most celebrated scenes in Kabuki, showing the stand-off between the brothers Umeomaru and Sakuramaru and Matsuomaru and Shihei. Of the utmost rarity. 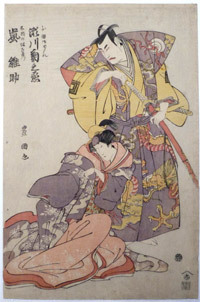 Toyokuni also designed prints of Matsuomaru and Shihei ( see this website ) and a triptych of the scene from the same play. 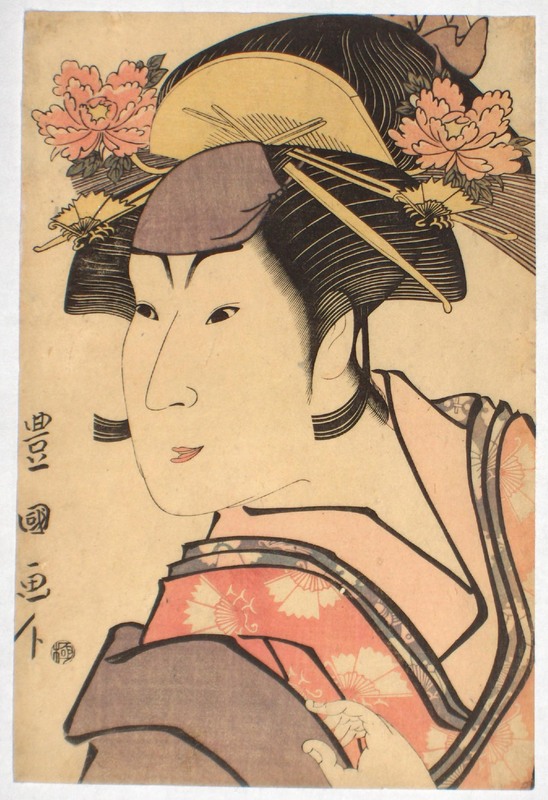 One of ukiyoe’s great portraits. Umeomaru ( ume, “plum” ) is shown with the red sugi guma makeup of the impetuous hero, and plum blossom on his costume. 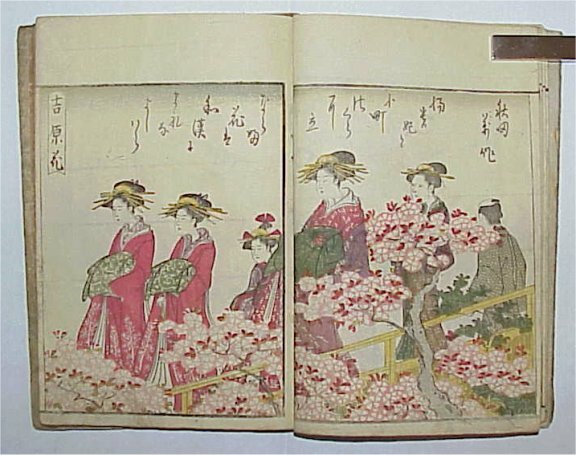 Published by Yamaguchiya Tadasuke, 1796. Fine impression. Mica-ground. Probably trimmed at top or bottom but I cannot, at the moment, locate another impression to compare. Some fading and other minor marks; small edge restoration. 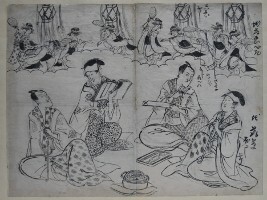 The role annotated top left in sumi ( as are other famous designs – possibly by the same collector ). As I cannot locate another impression and it’s unlikely there are more than a few, at best, impressions extant, a certain compromise on condition is necessary. 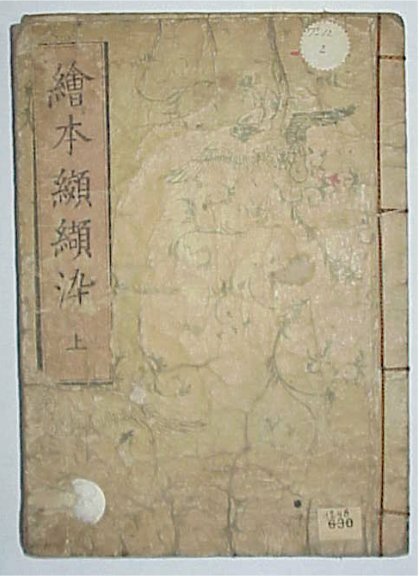 Signed Toyokuni ga. The actor Kataoka Nizaemon VII as the evil Minister of the Left Fujiwara Shihei in the Kuruma biki, “Pulling the Carriage Apart,” scene from the play Sugawara denju tenarai kagami, “ Sugawara’s Secrets of Calligraphy” performed at the Miyako Theatre 7/1796. 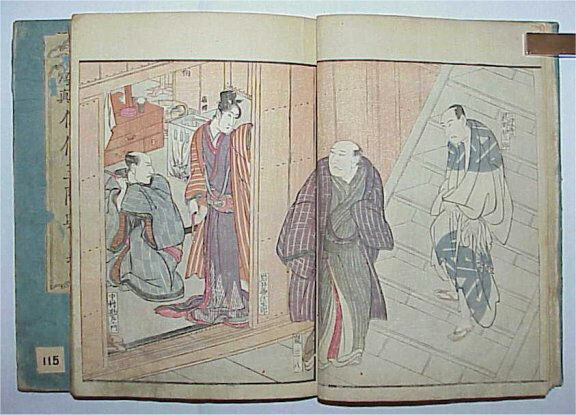 This is one of the most celebrated scenes in Kabuki, showing the stand-off between the brothers Umeomaru and Sakuramaru and Matsuomaru and Shihei. 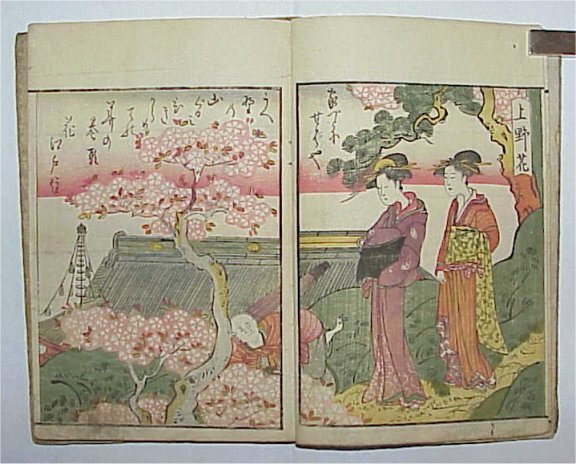 Of the utmost rarity: Another impression illustrated in Ukiyoe Taikei, vol. 9, no. 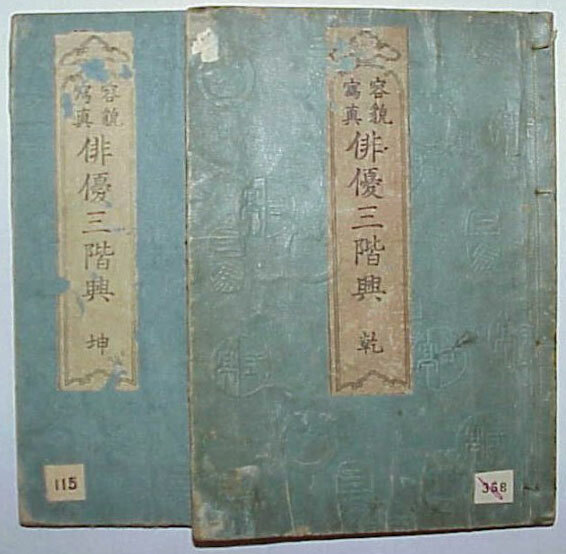 19 and also used for the cover of the book and slip-case. Toyokuni also designed mica-ground prints of Matsuomaru and Umeomaru ( see this website ) and a triptych of the scene from the same play – all excessively rare. 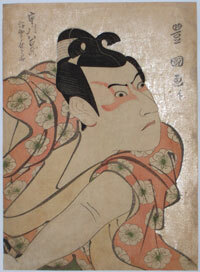 One of ukiyoe’s great portraits. 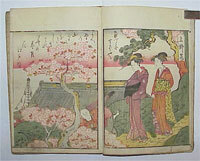 Published by Yamaguchiya Tadasuke, 1796. Very good impression. The eyes with brass powder applied. Trimmed heavily top and bottom and very slightly at side. Some fading, soil and other minor marks. 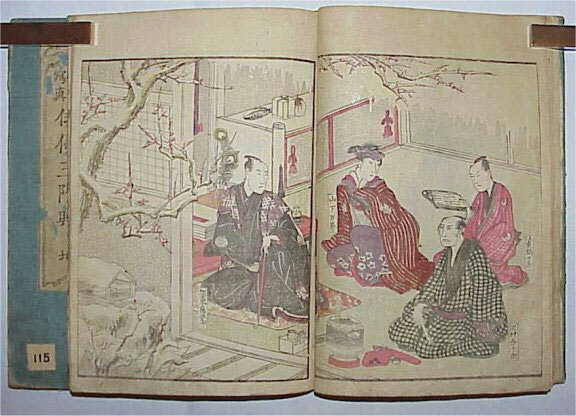 The role annotated in sumi top left. Other famous designs are known with these inscriptions ( by the same hand ? ). However, given the rarity and that, at best, there can only be a few impressions extant, a certain compromise is necessary. 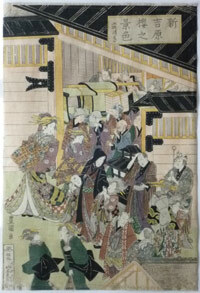 Signed Toyokuni ga.
Fine impression. Slight turning of the purple towards the edge. Some uneven trimming also into signature, otherwise good condition. Signed Toyokuni ga.
A double bust portrait showing Onoe Matsusuke I (above) as the evil lady-in-waiting Iwafuji and Iwai Kumesaburo I as Ohatsu, maidservant to lady-in-waiting Onoe, in the “Inner Garden” scene of the play Kagamiyama Kokyo no Nishiki-e performed at the Ichimura-za in the 3rd month of 1803. In this scene the loyal maid Ohatsu finally avenges the shame brought upon her lady Onoe and her subsequent death, by fighting and killing the evil Iwafuji. 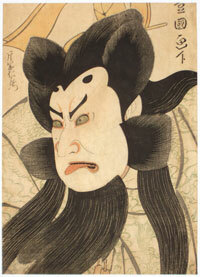 The latter is one of Kabuki’s great female villains and the role is often given to an actor of male roles to emphasise her unattractive nature. 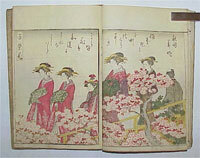 Another impression was in the Succo collection. 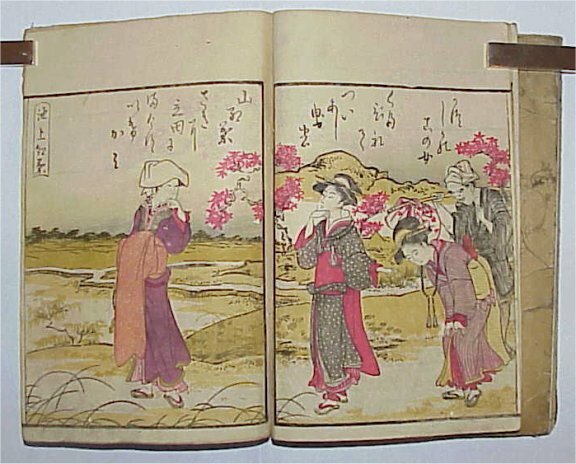 Illustrated in Toyokuni, Friedrich Succo, R.Piper & Co, 1913, no 523, p. 80. 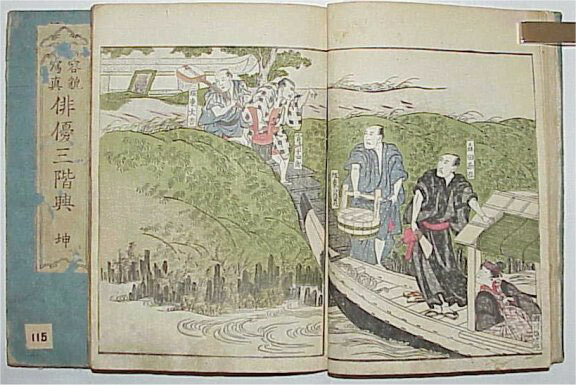 Published by Nishimuraya Yohachi, 1803. Fine impression. Some oxidation, otherwise very good colour. Light album backing and very small binding holes. Very good condition. 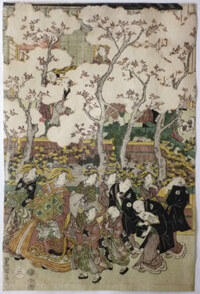 Signed Toyokuni ga. The well-muscled bodyguard Narukami Kajinosuke played by Sawamura Sojiro IV in the play Sugata no hana azuma no date-zome performed at the Ichimura-za Theatre, 3/1812. 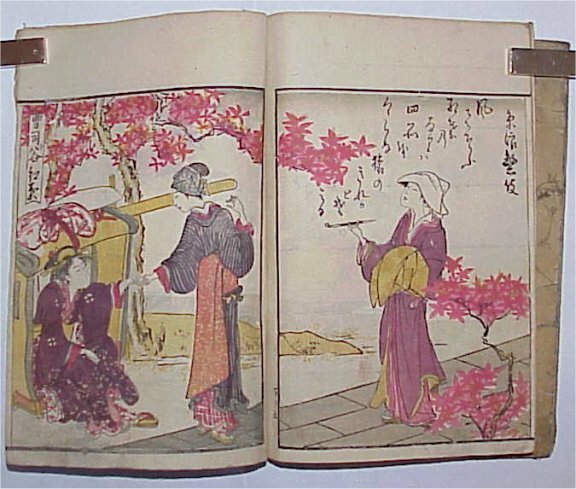 Published by Suzuki Ihei,1812. 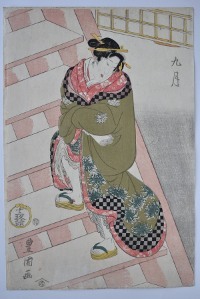 There is a companion design to this print showing Bando Mitsugoro as Kaminari Tsurunosuke. Fine impression and colour. Very slightly trimmed at bottom, otherwise good condition. Minimal soil. 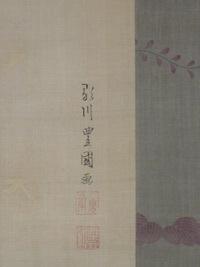 Signed Toyokuni ga.